The data in Database Tour are shown in enhanced database grids, which allow viewing and editing data in the most convenient way. Some of the features, described below, need focused database grid (to focus the grid, simply click its area) to work. The data in the grid can be presented in two views: multiple records view, where you see field (column) names in the top row and data records in other rows, and single record view (often called as vertical grid), where you see the selected record in two columns: field (column) names to the left and field (column) values to the right. To toggle between these modes, use the corresponding button of the main window or the button in the top-left corner of the grid. To quickly view field name and type for any column, just move mouse over the column title. This works, if Show column hints option is set. To quickly view contents of CLOB/MEMO (large text) field or any field, which data does not fit the database grid cell, just move mouse over the cell. This works, if Show data cell hints option is set. Boolean data can be shown as checkboxes (this depends on the appropriate view option). To edit such data, just click the centre of the cell, press Space key or simply type 'False' or 'True'. To sort the data by any column, just click the column title. To sort in descending order, simply click it again. To sort by several columns, click their titles in needed order holding SHIFT down. Note: This feature always works for query data; for tables, it works only if the field is included in index or if such sorting is supported by used database server or database engine (database inderface). To rearrange columns, just click the column title and move it to new place holding left mouse button down. To freeze or unfreeze any column (to prevent or allow its horizontal scrolling), use the corresponding button . To select group of records, use the corresponding button . To autoscroll the table, click mouse wheel and than slightly move the mouse in the needed direction. This will cause the data to be scrolled automatically. To increase the scrolling speed, simply move the mouse further from initial position. To stop autoscrolling, just press any key or click the mouse button. This feature is useful for large data sets. To expand rows (i.e. increase row heights), roll the mouse wheel holding SHIFT down. This lets you viewing long text, CLOB, or graphic data. Pressing + or - on numeric keypad holding CTRL down does the same. Usually BLOB fields can contain not only graphic data, but different types of data. Paradox graphic fields are usually interpreted as fields for bitmap images. For other types of BLOB fields, Database Tour in some cases can automatically detect the actual type of data in those fields and show this data properly. 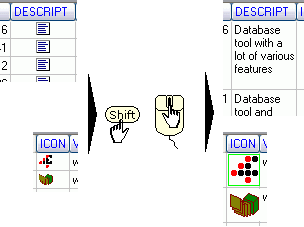 Note, that it can automatically detect only several graphic formats (bitmap, metafile, icon, JPEG, PNG) and some other formats (for example, RTF) and only if the data contains all needed information (e.g. headers) for this. When the data type is successfully detected, the Database Tour data grids shows the corresponding images directly in data cells (if the corresponding option was set in Options | Environment | Data View). To temporary hide selected column, press CTRL+H. To show hidden column, right-click the database grid, choose Show Hidden Column from the context menu and choose hidden column's field name. To show all hidden columns, choose Show All Columns from the context menu. To autosize a column's width depending on its content, double-click the right edge of its header (like you do in Excel). To autosize all columns, double-click the right edge of any column's header holding Ctrl down. To fine-tune the column width, press left (decreases the width by one pixel) or right (increases the width by one pixel) arrow holding Shift down.